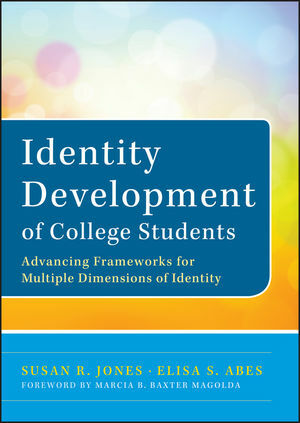 Building off the foundational work of Erik Erikson and Arthur Chickering, Identity Development of College Students adds broad and innovative research to describe contemporary perspectives of identity development at the intersection of context, personal characteristics, and social identities. The authors employ different theoretical perspectives to explore the nature of contexthow it both influences and is influenced by multiple social identities. Each chapter includes discussion and reflection questions and activities for individual or small group work. "Susan R. Jones and Elisa S. Abes have provided us with a comprehensive and beautifully written overview of the evolution of identity development theory. This book reads like a novel while at the same time conveying important ideas, critical analysis, and cutting-edge research that will enhance student affairs practice." "The authors masterfully present a holistic, integrative, and multi-dimensional approach to the identity development of today's college student. This text should be required reading for those engaged in research and practice in the areas of student affairs, counseling, higher education, and cultural studies." "Susan R. Jones and Elisa S. Abes's work is ground-breakingcharting new scholarly territory and making one of the most significant contributions to identity literature in many years. Building on contemporary and traditional theoretical foundations, Jones and Abes offer new models of identity development essential for understanding a diversity of college students." SUSAN R. JONES is an associate professor and section head in the Higher Education and Student Affairs Program at The Ohio State University. She was among the first researchers to look at multiple dimensions of identity in the student development research field and is the originator of the Model of Multiple Dimensions of Identity. ELISA S. ABES is an associate professor of student affairs in higher education at Miami University in Ohio. She teaches student development theory courses with an emphasis on identity development and is the originator of the Reconceptualized Model of Multiple Dimensions of Identity.